These flexible LED strips are great for a variety of installations including as Cove LED lighting, crown moulding lighting, for back bar display lighting, as cabinet strip lighting, high-lighting objects, for display lighting or for use to convert light boxes to LED. 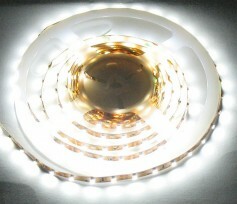 GBL LED Flex Indoor 3M has 180 SMD LEDs on a 3 meter (10' Length). Includes double sided tape. GBL LED Flex 5M has 300 SMD LEDs on a 5 meter (16.6') Length. double sided tape on the back. Wholesale 25 Meter (over 80') LED tape length now stocked for designers and installers who want to cut lengths to size on job sites. Solderless connectors, jumpers and end to end connectors available. DIMMABLE used with our Low Voltage LED Dimmer found on our Accesories Page or click here or with a dimmable LED Driver, dimming on the Line Voltage Side. -Wire Leads that can be connected from one strip LED to the next. -3M double sided tape on the back for easy strong and durable installation. 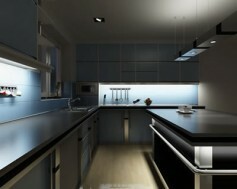 -Dimmable used with our Low Voltage LED Dimmer or with a dimmable LED Driver on the line voltage side. These Dimmable LED Strip Lights are Stocked and shipped from Vancouver, BC, Canada.